Yesterday a strange sight greeted us when we went for a Sunday morning walk on Portobello beach. At first glance we thought the beach was covered in long drifts of pinkish seaweed, extending almost the whole length of the beach. As we got closer we realised with amazement that the pink drifts were composed of starfish – thousands of them. Their colour was fresh and they were intact, but motionless. They lay there as disturbing evidence of some secret mayhem in the sea. We gently tried to move one or two of them, but they didn’t respond in any way. I had heard of starfish washing up on the coast of the US, but never expected to see a similar thing on my local beach. It made us all feel quite peculiar, to be honest. 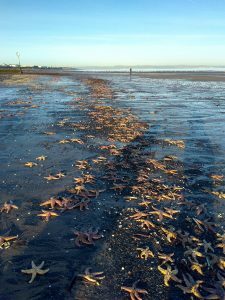 We had seen the odd starfish on the beach after storms, but had never imagined that there could be so many of them stranded like this. A single starfish can look exotic, but thousands of them looked simply uncanny. As a friend of mine wondered later, why only starfish? Even if there was an unusual Atlantic current sweeping sea creatures towards the shore, why should this event be so species-specific? There were no fish stranded on the beach. I took a couple of photos of the starfish and tweeted them. Later in the day, BBC Scotland got in touch to ask if they could use my photos on their news website. Oddly enough, it appeared that no professional photographers had been to see the starfish, at least not by that time. So my photos wound up on the BBC news page for Edinburgh and Scotland last night, and here is the link in case you’re interested.